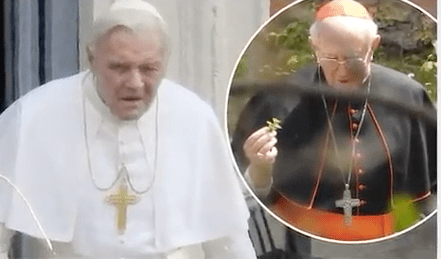 Hopkins, was seen in character as Pope Benedict, the former leader of the Roman Catholic Church, as he shot scenes for The Pope in Rome, in Italy on Monday, according to the Daily Mail. Dressed in the ceremonial white robe, and gold crucifix necklace, Hopkins was seen emerging from a building. The film is centered on the relationship between Pope Benedict and Pope Francis, who is played by Jonathan Pryce, who was dressed in a black robe with silver cross necklace. 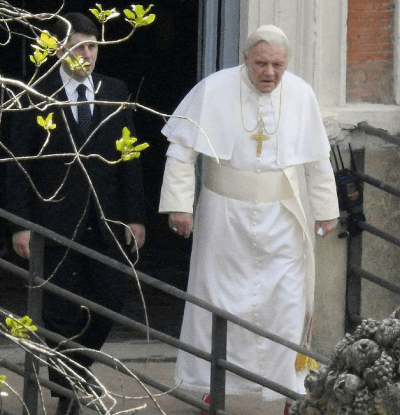 The film explores the relationship and opposing visions between two of the most powerful leaders in the Catholic Church, both of whom must address their own pasts and the demands of the modern world in order to move the church forward. Also, according to Deadline, the Netflix film will go into detail regarding Benedict’s resignation from the papacy.